Part ONE of our "District 4 Head-to-Head Tour," which seeks to interview all eight candidates running in a special election to replace Councilmember Marilyn Praisner, who passed away in February. A primary will be held April 15, followed by a general election May 13. Photo courtesy of the Gazette. Nancy Navarro and I are enjoying lunch at Ledo Pizza in Colesville, a few blocks away from the home she shares with her husband and two daughters. It's a Wednesday in early March, soon after the pollen's started, and we're both stuffy and miserable, but the interview soldiers on. It isn't until after an hour that the current School Board president and Venezuelan native reveals why she's running for County Council, and her voice suddenly drops out, sapped of its normal enthusiasm. "I'm so not a politician," Navarro says, and you have to believe it. "Deep down inside for me, it's about my kids, it's about my husband from Haiti. They grew up with certain hopes . . . if you want to run for public office, you shouldn't have to deal with all the crap I went through. I will be a pain in the behind for all these people because they weren't counting on it." She adds, "I could not live with how this district is characterized." Like all of the candidates running to replace Marilyn Praisner for the District 4 Council seat in this year's special election, Nancy Navarro never expected to find herself on the campaign trail so soon. The councilmember, who passed away seven weeks ago, seemed to be doing just fine after a car accident last fall. "It was weird because I saw her at the Democratic Party Brunch and she looked very strong," Navarro says. "She was leaving the building and I kept yelling 'Marilyn! Marilyn!' and she turned around and asked her husband 'Why are you so slow?' It seemed like she was fine." Suddenly Navarro, who'd just won a second term on the School Board in 2006, was out pounding the pavement for votes once again. "Seeing first-hand so many of the issues that this district is facing . . . I see myself as the person to take on this responsibility," she says. "My girls looked at me like 'what? are you crazy?'" "It's a tall order, to follow a lady like Marilyn Praisner," she adds. 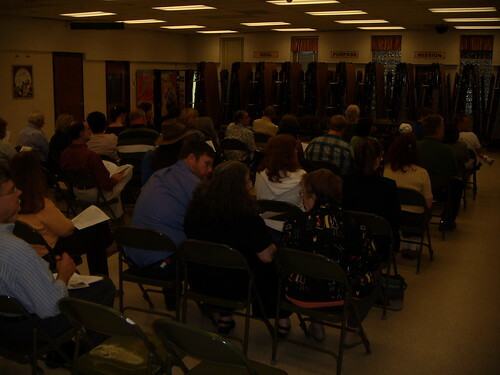 Navarro was warned that many East County residents, like these shown at a Citizens Involved meeting last spring, are concerned about land use and development issues. At her campaign kickoff two weeks ago, Navarro said she believed in the "politics of possibilities," but some of her fellow Democrats made it clear they didn't buy it. "My opinion is that Nancy Navarro is partly responsible for the current budget crisis," says former candidate Cary Lamari, who threw his support behind Marilyn Praisner's widower Don after County Executive Ike Leggett and other higher-ups asked him to step down. Lamari was inferring that, as current president of the School Board, Navarro supported budget increases for Montgomery County Public Schools (among them, regular pay increases for teachers) that may further exacerbate the county's large deficit. "It's too early to know how the numbers are gonna come in," replies Navarro. "Folks have not sat down to address the whole deficit. I was surprised that it went from $400m to $297m just like that." Leggett also warned Navarro about staying in the race, suggesting that she was out of touch with East County voters. Frustrated by living in a dumping ground for subsidized housing in the 1980's and stuck in a building moratorium for two decades afterwards, many residents were drawn to Praisner's passion for planning, earning her four straight terms on the Council. "To be told that people in this district only care about land use issues and development issues and the ICC . . . I've been lectured that if I don't know the intricacies of these issues, then I won't be able to win," says Navarro. "I would like to demonstrate that the residents care about other issues." While she may not share Praisner's familiarity with local development, Navarro says she's more than willing to learn. "I tend to be very analytical, study things, get a lot of points of view and that's usually how I guide my decisions," she explains, adding, "I've learned speed-reading." Opponents have characterized her as the "developer's candidate," but Navarro insists she hasn't even met one. She wants to "to sit down with developers and say 'no, you can't have carte-blanche to do what you want'," but also to explore more "innovative possibilities" for future growth in the County. "To me it's not so much a matter of 'let's set a number for how much we need to grow' but 'what does a livable community look like? '," says Navarro. "I was born in a city of five million people, Caracas. That's what crazy looks like. I know what unchecked growth looks like." Developments like the WesTech Village Corner in Calverton have been embraced by East County residents eager for higher-quality restaurants nearby. Carting around her fifteen-year-old daughter, a student at Springbrook High, has shown Navarro some of the facilities East County is starved for. "My daughter likes that she can walk here [to Colesville Center] with her school friends . . . she'd like to have more here so she wouldn't have to go to Downtown Silver Spring or the Olney Theatre," she says. "My husband and I are constantly chauffeuring her to Silver Spring or Olney, so I hear it." And the burden isn't just felt by high schoolers waiting to take Driver's Ed. "I was at the new IHOP on Cherry Hill and I waited for, like, an hour," she says. "The people I talk to lament that if you want to go to a restaurant, you have to go to Rockville or Bethesda or Silver Spring . . . I think we need to explore 'what do we have now, what can we bring here that responds to the income levels because we have a lot of low-income residents but we also have a lot of middle-class'." "Sometimes," she adds, "people tell me 'I forget we have a library here'." 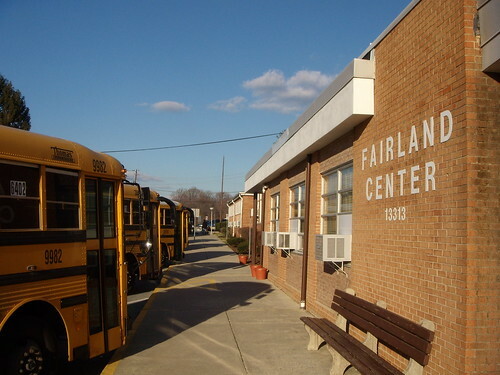 The Fairland Center in Fairland, currently home to Galway Elementary School while its building is modernized. On the School Board, she's been an integral part of the Kennedy Cluster Project, which aims to reduce the achievement gap between Black students and their White and Latino counterparts. Currently in a trial stage, the Project - located in the cluster with the highest percentage of Black students in the County - brings together different County agencies to provide a "safety net" for struggling students. For instance, Navarro explains, if a school is notified about a pending gang incident, they're forbidden to act on it, but they would be able to contact the police or any other appropriate organization. "I view school buildings as the epicenter of what's going on outside," Navarro says. "The majority of the schools in the district, if you go inside and close your eyes, you won't believe you're in Montgomery County, it's so diverse." Despite its rapid growth in the past few decades, that "diverse" population has had increasingly less of a say in how the County is run. As a native of Venezuela, Navarro's goal is to bring those people to the table. "At our meetings, we'd have the same five PTA people," she laments. "I took it on myself to go into the community and find [people] . . . People say 'are these people really going to vote as a bloc,' but I'm not giving up . . . the reality is we have a growing immigrant community that tends to be isolated." In order to do so, she explains, you have to go past the PTAs and HOAs and into the streets. "You have to do grassroots. Find out who are the organic leaders in these communities," says Navarro. "In these low-income and immigrant communities, word-of-mouth goes a long way . . . you pass along information that is relevant. You don't do focus groups. People want something that is tangible and relevant." Navarro expresses frustration with the County's policy-makers who claim to represent communities they may not be familiar with. "I am not so arrogant as to say I can speak for everyone," she says. "It's very easy to be privileged and entitled and say 'I represent all these people' . . . have you ever sat in a shantytown in Caracas with members of your own family? Have you ever had to deal with poverty?" "Who has been given the wand to determine all things progressive in this County, and where are the immigrants, the people of color?" While Nancy Navarro claims not to be a politician, she proves to be a woman of the people. And in a suburban community whose original residents are grappling with an influx of younger, more diverse people, Navarro sees herself as the missing link. "I'm building a legacy, building on the present and looking to the future. I'm respectful of the people who've lived here for forty years, I know what they want, but I also want to build that bridge," she says. "Part of the new paradigm has to be if a person has worked in the community on important issues, you should have the right to run for public office. You should not be delivered." Nancy is supporting a 30% pay raise for the school administration---17% over three years PLUS 3.5% annual step increases in a recession. She supports Leggett's property tax increase, the largest in 20 years. She would give away the store and bankrupt the county. Why don't you run an up-to-date photo? That one is 10 years old. Navarro and Praisner represent the the second-rate politicans that District 4 has come to be known by. Can't the East County come up with a solid candidate that isn't a psyco? This is quite simply an awesome interview. I sincerely hope that Nancy Navarro makes it to the Council. Her interview is a breath of fresh air. I am a resident of Disrict 4 and I know that my entire neighborhood is going to vote for her. We are so proud of her work on the School Board for the disadvantaged and children. Nancy Navarro gets it and this interview shows it. Go Nancy. We are not going to elect someone who wishes to be a place holder until the next election. This ought not to be a coronation if my neighborhood has anything to do with this. And she presents so well on television and in debates compared to the other SIX men running for office. Go Nancy, we need you to help us revitalize our communities! I agree with "supporting navarro." I hope Nancy Navarro wins. Of all the candidates in the race, she alone truly represents the new face of Montgomery County communities in District 4. As a woman, I am so proud of the smarts, grace, dignity and calm under fire that she brings to the table. The Council could use her over there. She has earned my vote! Navarro is irresponsible with budgets. Hold on to your wallets! Do you really want two former school board members on the County Council who are in the pockets of the teachers union and their intent on holding back our kids from achieving greatness so that they can put in another teacher holiday (AKA teacher drinking day). Only Mark Fennel can rein in unsustainable spending by the school system. Vote Mark Fennel for your kids and District 4. Number one: I think negative smear politics have no place in a Democratic Party Primary. Witness the nastiness at the federal level as a case in point for why this is unacceptable. Number two: It is disgraceful that in a Democratic Primary we have so many "progressives" bashing TEACHERS and labor unions??? With the massive growth of corporate power in America (and corresponding decline of worker power) why is everyone suddenly anti-union -- just because they're supporting Navarro? All of the politicians pander to the unions when they need to win, then all of a sudden the unions endorse someone they oppose and then they are public enemy number one??? Lastly, since when are teachers overpaid? Nobody believes that nonsense. It sickens me how everyone pays homage to education and teachers when they run for office, and now that they think it is politically advantageous to bash educators, they go for it? From FY06-08 the School administration added over 1000 employees, many of them non-teachers, while the number of students dropped 3,076. Navarro will support a small selected group of cronies at the expense of the people in District 4. She promised the union tax increases to meet their demands on question 3 of their questionnaire. That is called a grovel. Didn't the Council also approve the school contracts???? Didn't all the Councilmembers now complaining about the unions kiss their asses when they needed their endorsements in 2006???? Marc Elrich and his "progressive" allies insist that because they say so, Nancy Navarro is beholden to developers. They have no evidence of this whatsoever. Nancy has never cast a vote on a development or land-use issue. But, just like Joe McCarthy claiming everyone is under the influence of Communists, Marc loves to label people he doesn't like as "pro-development." Ask Marc whether he knew about the illegal robo-calls smearing Navarro. I guarantee his fingerprints are all over them. Last night at the People's Community Church, both Navarro and Praisner reaffirmed that they would vote to exceed the charter limit on property tax revenue. We already have a County Executive and eight council member in favor of that position. Don't we need a different viewpoint on the council? One that won't drive people out of their homes and Montgomery County housing? Hey, I was up at the People's Community Church for the debate, and despite my best efforts, seem to remain unnoticed. I feel like a Republican or something. Oh, that's right, I am a Republican. Be that as it may (and it is), in general I find myself drawn towards the Centrist position, rather than that of the extreme Individualist or the extreme Statist positions. What I mean is this: I don't at all mind being reasonably taxed at a fairly high level, so long as I get a high level of service, especially the core competencies such as fire/rescue, law-enforcement, and infrastructure. Social programs, outside of entitlements for citizens, come next, with a priority directly proportional to their utility to the core competencies. Nancy Navarro gave some interesting insight into some of her goals and approaches to those goals. This forum will be broadcast on Cable Channel Montgomery or Access Montgomery, possibly both; I suggest that you tape it and possibly upload parts to YouTube. When asked about how to combat gangs and promote "youth engagement", she said something to the effect -- I don't remember the exact words and please correct me if I am in error -- "we have to provide after-school and out-of-school (summertime, etc.) programs and opportunities, and we have to increasingly regard these programs as an extension of the schools". Wow, that sounds positive enough, innocent enough, but that does constitute attempting to extend the school system's authority as well as its opportunity into the lives of children and young adults, outside of school hours. I don't have to point out, but shall, that this obviously provides more employment opportunities for schoolsystem personnel, as well as probably bring potentially very expensive. Furthermore, it clearly owuld extend the power of the County (or State) even more into people's lives. This potentially is "creeping Statism" or an intrusion of socialism into individuals' personal lives. My own approach is really almost the opposite, to have the State (County) encourage individuals to form their own groups to provide opportunity and enrichment to the lives of young people, more along the line of "it takes a village to raise a child", but without the implication that there should be intrusion into the independent and personal lives of individuals, at taxpayer expense. As I said, tape the program and YouTube it. Nancy seems like a very nice lady but if you ask parents who are active in the school system in District 4, you won't find too many that care for her. At least that is the case in my neighborhood. You'd think that she would have widespread support among parents of school aged kids, but she clearly doesn't. I think you'll find some feel that way about all of the candidates, actually. So to see it written out like this is amusing, because it smells like campaign spin to me. Nancy is in the tough spot of having to defend her MCPS record. A careful review of her record and her interaction (or lack thereof) with local community and school activists paint a very clear picture of what Nancy is all about. She certainly is not the balanced leader that she claims to be and she certainly hasn't served the needs of all children during her tenure on the BOE. I repeatedly tried to get her attention on an important matter impacting my kid's school and she absolutely would not return emails or telephone calls. When I shared my experience with parents at other "upper middle income" MCPS schools, I heard similar "Nancy" stories from them. Seems that your only chance of getting Nancy's attention is if your kid's school profile is different from my kid's. Her selective attention to certain groups and income cohorts of the MCPS school population during her time on the BOE severely undermines her claim to be about representing all people in our diverse district. We need a leader for District 4 that can transcend race and income. I'm not sure who that person is, but I know it is not Nancy Navarro. Note that I am not advocating for one of her opponents. So I hope none of the posters dismiss this as campaign spin. Navarro has a well financed PR machine running at full steam now. Just look at all the mailing pieces and signs, and look at the design work that has gone into them. This is a local race. Without exception, every politician who has taken significant contributions and support from special interests has remained beholden to them. The last thing we need is another UNION YES puppet on the Council. Somebody has to pay for all that - and it's US. In terms of results, under Ms. Navarro, test scores have declined (she recommended lowering the criteria for minority students to offset this in a candidate forum prior to the last BOE election) and expenditures have spiraled upward by....wait....can't see the books! Yet, Special Education programs have been recommended for cuts, Paint Branch High School's fire alarm system failed due to age and the Fire Marshal had to order a round the clock staff fire watch so that classes could be held, and my kids still have classes in trailers. We've seen what Ms. Navarro has to offer, and beyond the pleasant smile and demeanor, it's a failed leadership record. In fact, I hope she does leave the Board of Education so that MCPS isn't lead into receivership and doesn't lose even more of its performance edge. Is this what you or I want from a Councilmember?